Nope | Will It Be OK? I made this in response to that pro-gun image I ranted about recently. I actually support gun rights, but what I don’t support is stereotyping crazy people. Or anyone at all. 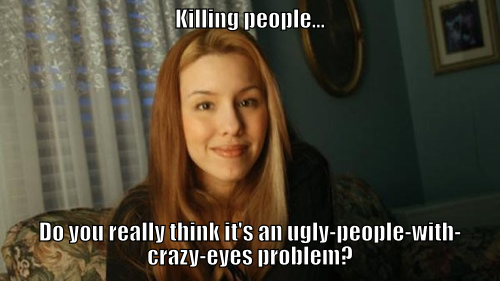 This entry was tagged jodi arias, memes, this angers me. Still isn’t a crime to defend yourself from the threat on your own life like Jodi had to do, even when a jury might not understand the facts of the case. That’s happened many times before and will happen many more times again in the future. Travis got off lucky in my book, at least we can all be reassured by the placing of his soul in Hell by our Lord. Add Jodi to the long list of prosecutorial-misconducts, jury-errors, and defendant-victim-atrocities. Hi there — I approved your comment, but that doesn’t mean I agree with it. 😛 I’m actually on the “Jodi’s guilty” side but of course full disclosure, I’m not an expert on the case and while I’m familiar with it, I haven’t made a point of researching it extensively, so I could be wrong. Right now I don’t believe I’m wrong. Didn’t Jodi bring at least one but possibly several weapons when she went to see Travis? Wouldn’t she only do that if she were planning on at least possibly killing him? And it just seems fishy to me that she would have left, not gotten medical help for Travis when he was wounded, and kept on with that story about fake intruders that came into the house. Certainly there are women who are abused and I would not blame anyone for true self defense, but I doubt that happened in this case. Willitbeok, at least if Jodi killed anyone, it was that pedo-monster Travis with which I am happy and applaud Jodi for doing so if in fact she did it. I have often questioned why she only cut him about 30 times and only shot him once. I would have done much more applicable things according to the circumstances, and I believe Travis got off pretty easy for the crap he did to Jodi. Yes, Jodi killed Travis; Thank God she did before he hurt anymore people. The family of Travis Alexander made a mockery of the criminal justice system where their actions and testimony today may very well lead to the end of future victim-testimonies in court given that none of them are actually victims as they so claim. They are all cohorts in not trying to “control” Travis and seeking out the help Travis actually needed from a psychological-perspective. I would sentence each family member to ten years in prison for their actions of not intervening to protect society from this child-molester-monster-batterer-Travis. The only victim in this case is clearly Jodi Arias who is in this situation only because of the attack by Travis who stated he was going to harm and/or kill Jodi. Doesn’t take a shrink to understand just how evil this child-perp-Travis really was. I truly couldn’t be happier he’s now gone. Praise the Lord! Thankfully, Jodi protected herself and Travis is now dead. Praise the Lord! Travis would never be able to survive on the streets of the United States today even after he would have ever completed his prison term for attempted murder of victim-Jodi. I still do wonder why Jodi only cut Travis about 30 times, why not more? And, why only shoot Travis only once? He deserved some much more, imo. Child-predators and women-batterers like Travis need to be in one place and one place only. Now, Travis is there. Thank you so very much Ms. Arias, God speed.